Kitchen remodeling in Laguna Beach CA can be a big investment. It’s important to trust your investment to a true professional like Cabinet Magic. With Cabinet Magic on the job, you can rest assured every aspect of your project will be handled to the very highest standard. This includes not only the typical contractor work of construction and installation, but also help finalizing your design and finding the right products and materials. Going for a bold new look with kitchen remodeling in Laguna Beach CA can be exhilarating. But you may also feel a little bit worried. What if the finished design doesn’t turn out like you expected? 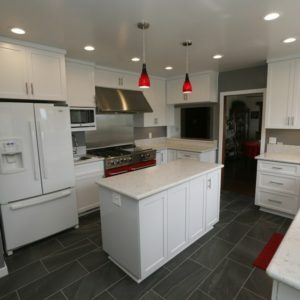 At Cabinet Magic, we understand how important having an accurate visualization of the finished kitchen remodeling in Laguna Beach CA is for your comfort and peace of mind. That’s why we always bring proposed kitchen designs to life using 3D rendering software. You’ll be able to see and approve all aspects of the design down to the last detail before we begin work. Would you like more information about working with Cabinet Magic on your kitchen remodeling in Laguna Beach CA? Call us at 800-828-4380 or contact us online to schedule a free in home consultation. We can help you price the upgrades you want and give you a free estimate.